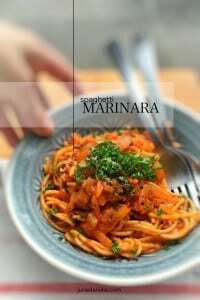 Marinara Sauce Recipe for Spaghetti | Simple. Tasty. Good. Ah! Classic marinara pasta! 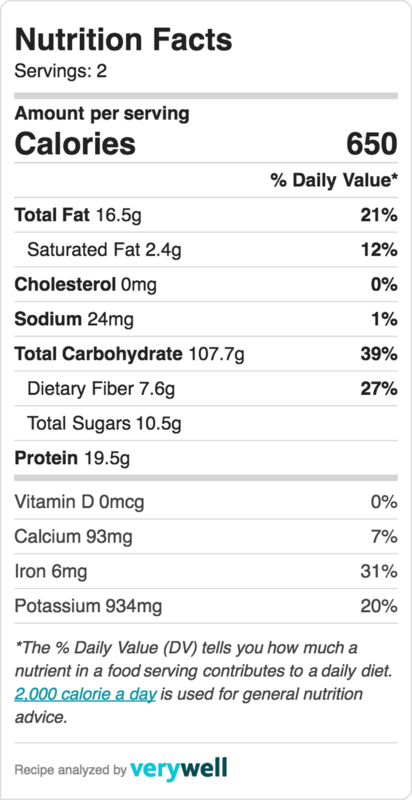 But beware: marinara doesn’t always means with fish or seafood. 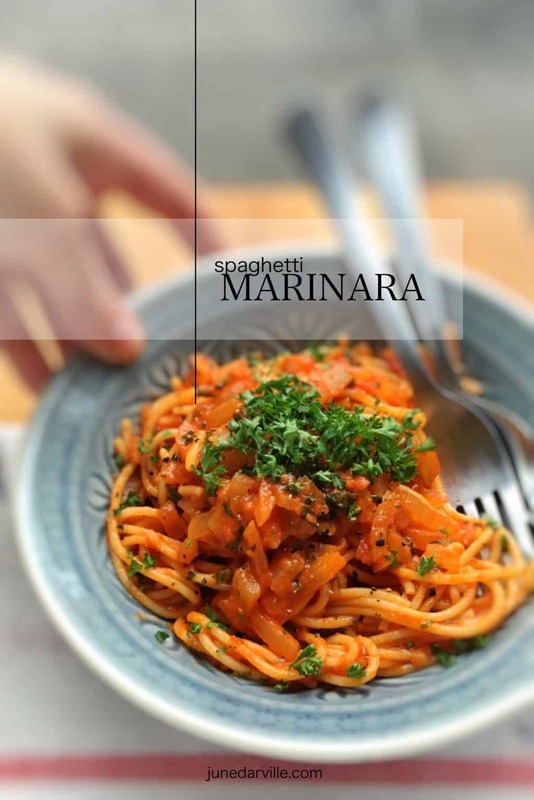 This marinara sauce recipe is a very simple but highly delicious Italian fresh tomato sauce. The most important main ingredients for a marinara sauce: tomatoes, onion and garlic. You can blend or mix the sauce in the end if you like a more smoother sauce but I like it best when the tomato and onions are still chunky. Don’t confuse this veggie marinara sauce with pasta ‘a la marinera’ or fisherman’s style pasta which contains seafood and/or fish. Love pasta sauces? Then check out my classic spaghetti sauce recipe as well! Dig in! Blanch and peel the tomatoes first. Therefore fill a high pan with water, place it over high heat and bring it to a boil. 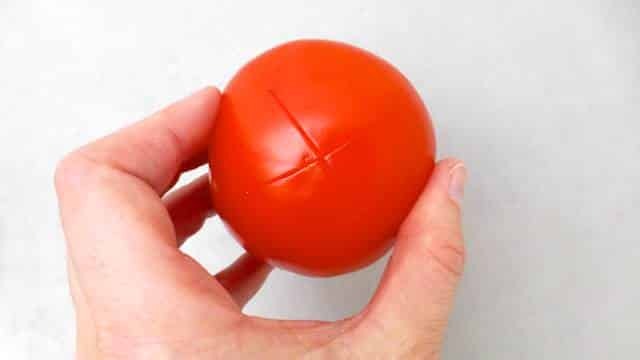 Make a little incision using a knife in the fresh tomatoes and add them to the hot water. 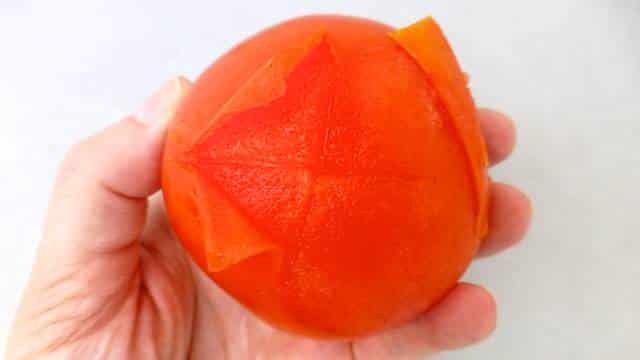 Cook the tomatoes for 15 seconds. Then immediately refresh them under cold running tap water and peel them. Add some olive oil to a saucepan and place it over medium heat. 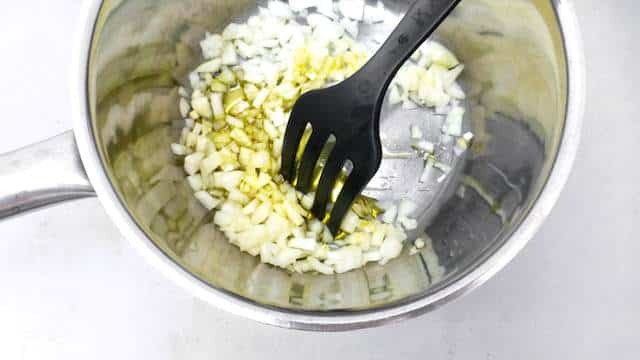 Add the chopped onion and garlic. Cook both gently for 2 minutes. Chop and deseed the tomatoes. Then dice the tomato meat. Add this to the onion in the saucepan. Season with some pepper and salt. Stir well and lower the heat. Then put a lid on the pan and simmer the tomatoes for 5 minutes. The sauce should be a little chunky. Stir and add the tomato paste, dried thyme and red wine vinegar. Stir and simmer for 3 more minutes. Check the seasoning and add extra pepper, salt, tomato paste or red wine vinegar to taste. Add some freshly chopped basil. Then take the tomato sauce off the heat and let it cool a little. In the meantime fill a high and large pan with water and add a good dash of salt. Place the pan over high heat and bring it to a rolling boil. 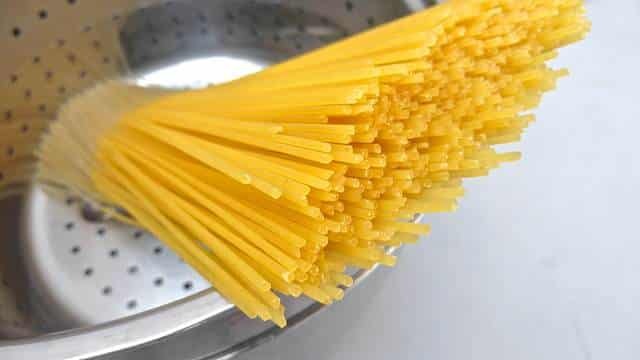 Once boiling, add the spaghetti to the water. 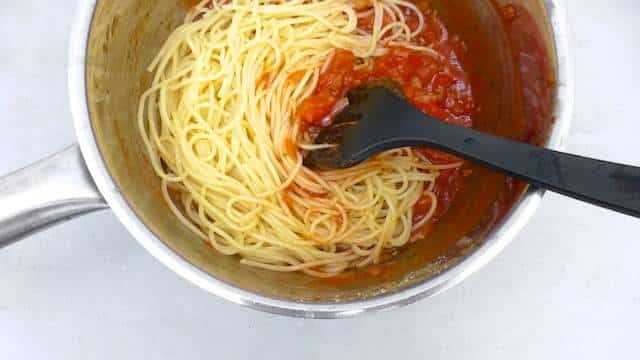 Cook the spaghetti for a couple of minutes until tender and drain it. Then immediately add the cooked pasta to the marinara sauce and stir well. Transfer the marinara pasta onto plates, sprinkle with freshly chopped basil and serve hot.